With a name like C Plus, it’s natural to begin taking guesses as to what ‘C’ stands for. I’ll take the guesswork out for you; it stands for ‘community’. 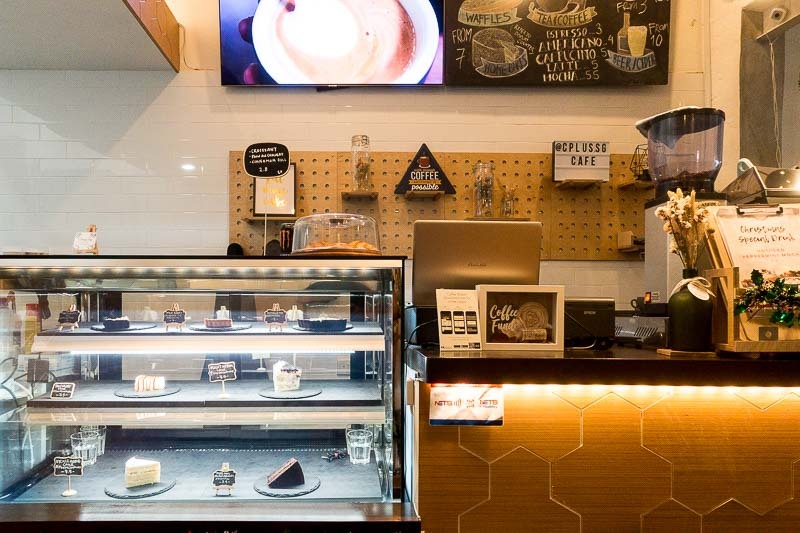 It is the vision of having various brands and partners come together to collaborate and present a brick and mortar venue for a cafe, a florist and even a design & fabrication company. 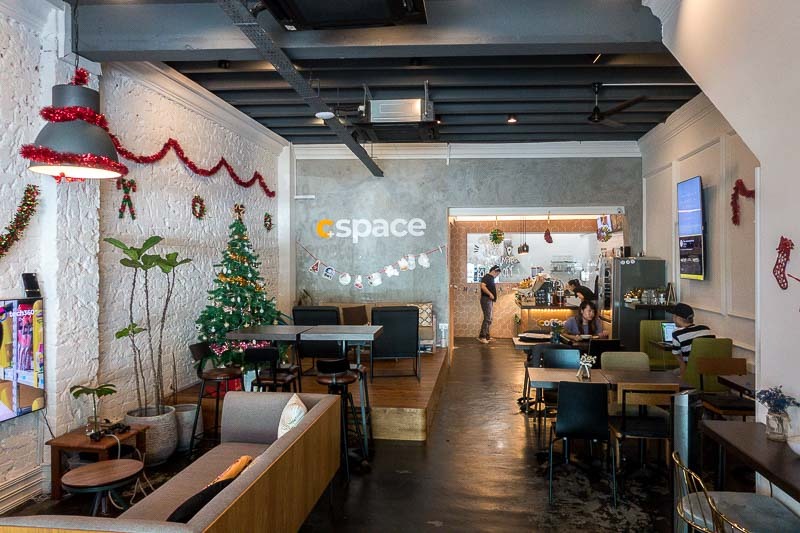 The space, located in Rangoon Road, is a mish-mash of decor styles, which makes it feel like a bunch of people had differing opinions of what aesthetic they prefer and they put everything together. In short, it definitely felt like a collaborative arena the moment I walked in. 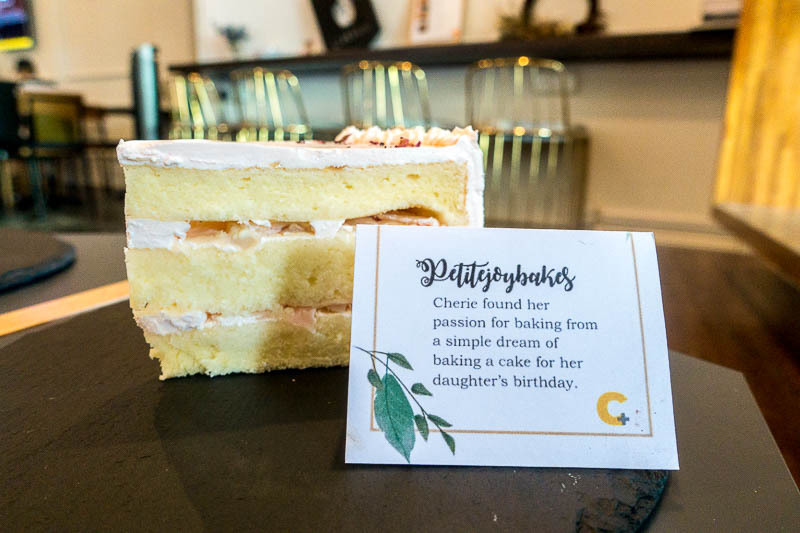 I was there to try the much-raved-about curated collection of home bakers’ goods, from the likes of @ElijahPies, @OurFirstBake and @PetiteJoyBakes. 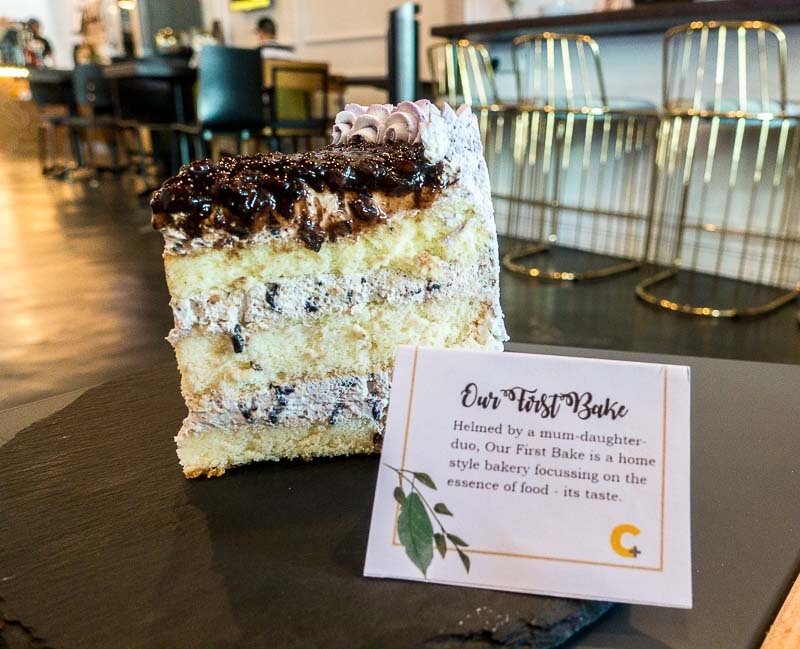 C Plus works as an excellent platform for these small-time home bakers to share their love for the craft as well as expand their home business beyond social media. But first, I needed to get my tummy filled with savoury bites. Thankfully, they’re known from some choice mains that weren’t too shoddy. 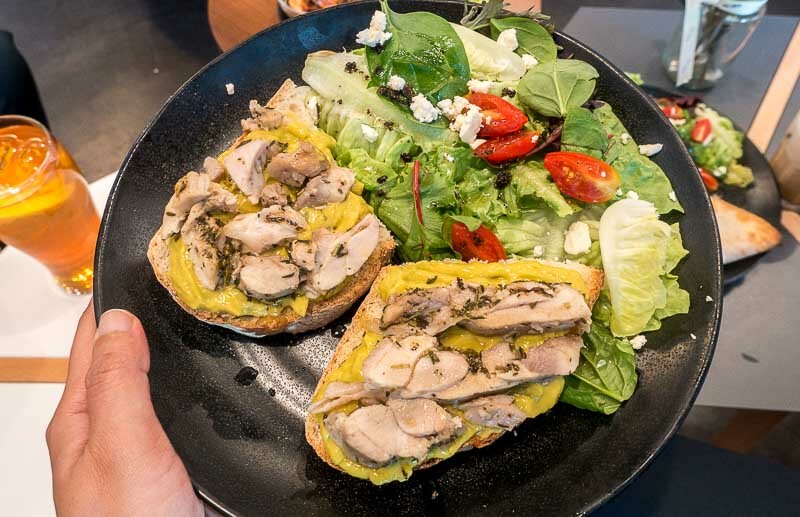 The first was the Green Grilled Chicken (S$10.80), grilled chicken thigh with guacamole, served on sourdough toast and a side salad. For one, I did love the heartiness and crispiness of the sourdough toast, but the guacamole left me with very little to comment on. And when I say little, I literally mean it tasted of very little; it was simply a bright green paste that lacked flavour, leaving me confused and disappointed. But hey, at least the chicken was moist. It’s amazing that regardless of how simple it is to make a quesadilla, so many places can mess it up. Here, the It’s A Wrap! 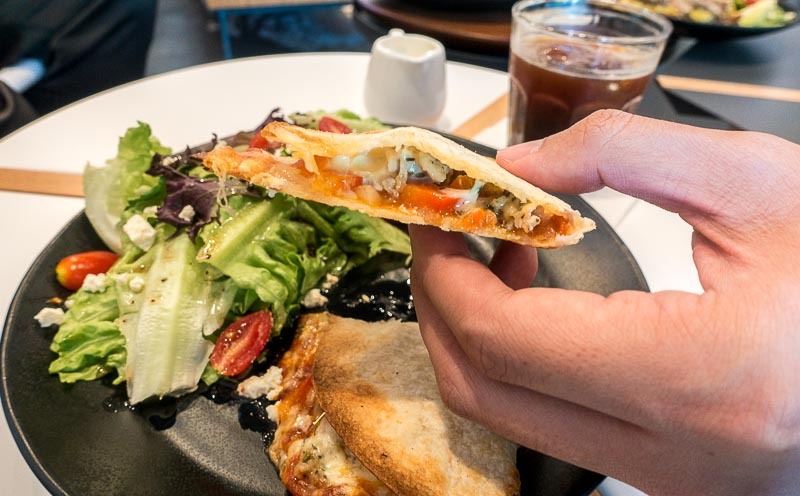 (S$10.80, with a choice of either chicken or prawns) resembles a quesadilla more than an actual wrap, so be prepared for that. In spite of its misleading name, it was actually quite delicious. I suppose I was partial to how crisp the edges were, while the melted mozzarella with chicken, salsa and red peppers just oozed like lava in my mouth. I love contrasting textures, so you could imagine how much I enjoyed this! That was until I had a whiff of this: Spice Me Up (S$10.80). 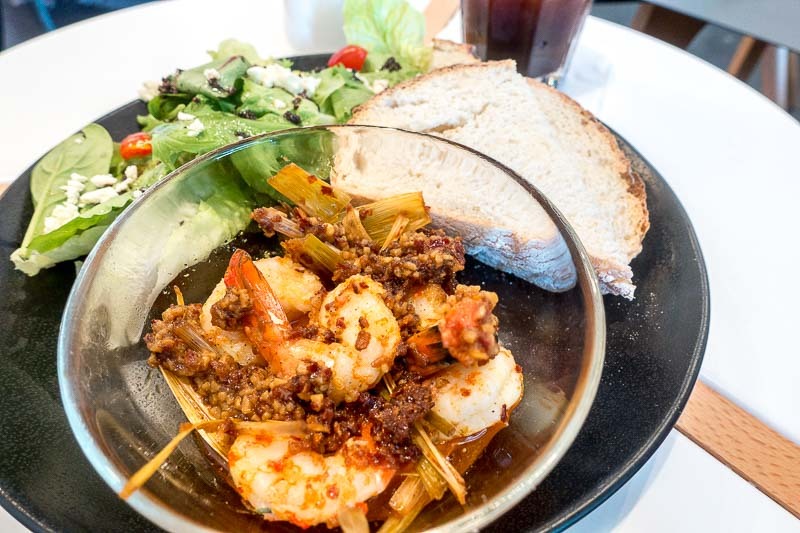 The description in the menu is tame, stating that the dish is simply garlic butter prawns with a tinge of chilli, served with sourdough bread and a salad. The spiciness was punchy, but more so, the flavours were phenomenal. What I loved most was how piquant the dish was, with the use of lemongrass, chilli and garlic. It was as aromatic as it was flavourful, so it was a definite toss-up of who would get the honour of finishing off the last prawn. 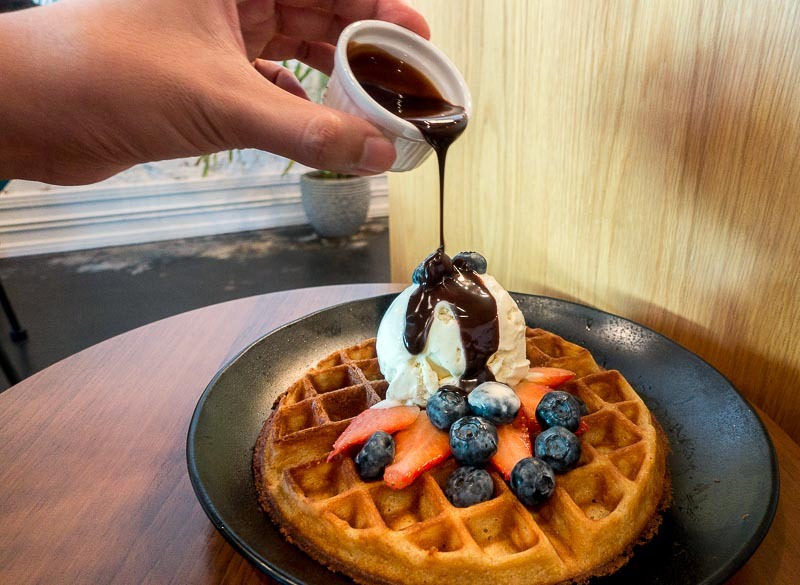 Besides serving cakes from home bakers, they also serve their own in-house specials of waffles and simple pastries. We went with Wheat Buttermilk Waffle (S$7.50, with a choice of either butter or chocolate/maple syrup). 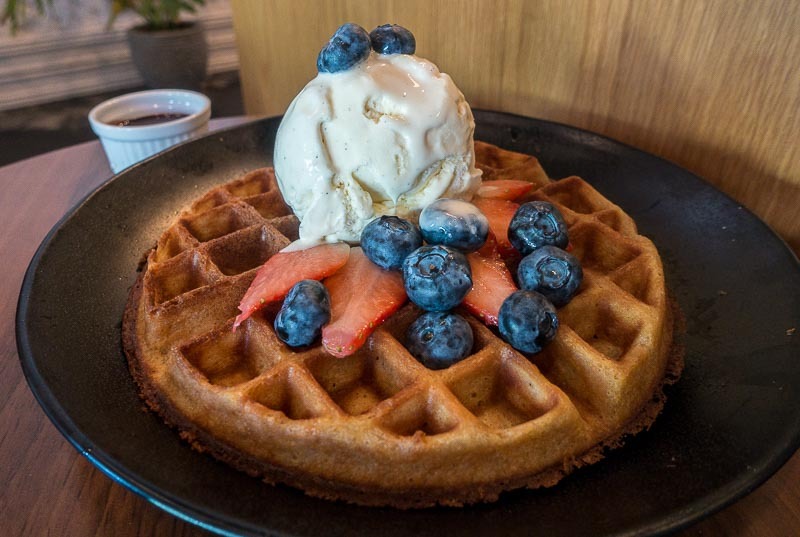 Having been told that the texture of the waffle differs slightly from the fluffy variety that many of us are used to, I actually enjoyed this chewier and denser version. Also, I appreciated that the chocolate sauce wasn’t overly rich — it would’ve been too overwhelming otherwise. Now, it was finally time for me to get a taste of homemade goodness. 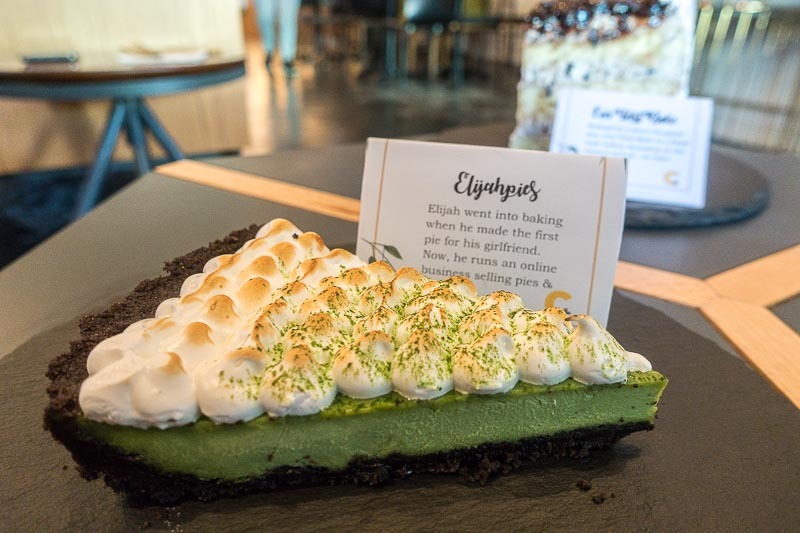 First was Matcha Latte Pie (S$7) by @ElijahPies. Using chocolate cookies as its base, the pie is filled with matcha custard and topped with slightly charred meringue. The smokiness of the matcha wasn’t intense, but I felt that the chocolate cookie crust more than made up for it. It was a balance of sweet and deep earthiness, coupled with an ideal marriage of crumble and custard. @PetitJoyBakes’ Lychee Rose Cake (S$7.50) is a simple sponge cake layered with sliced lychees, and frosted with rose water swiss meringue buttercream. The only positive point about this was how cloud-like the sponge cake was. The lychee flavour wasn’t only overpowering, but it also tasted overly sweet and artificial. It reminded me of the remaining lychee-saturated water that one finds in canned lychees. There was no character to the cake and proved to be forgettable. The third and final cake was @OurFirstBake’s Pulut Hitam Cake (S$7.50). Using coconut sponge and coconut mousse, it is topped with a glistening layer of black glutinous rice pudding, laced with gula melaka. It tastes exactly like the actual pulut hitam dessert, save for the texture of pillowy sponge layers being thrown into the mix. The only drawback for me was that the black glutinous rice pudding wasn’t mushy enough; it still felt a tad gritty. Given the not-so-accessible location of C Plus, I can understand why many cafe-hoppers would be reluctant to make the trip. I can’t say if I’d return here, solely based on its remote location. 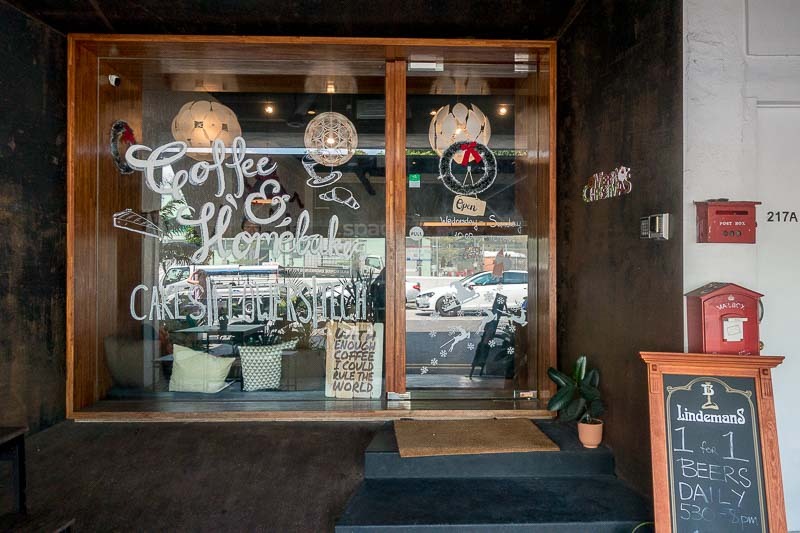 However, if cafes in isolated and out-of-the-way nooks are your thing, then this slightly hidden corner will meet your cafe criteria.